In a WBA heavyweight eliminator, seven-foot former WBA heavyweight champion Nikolai Valuev (48-1, 34 KOs) scored a one-sided twelve round unanimous decision over former WBO heavyweight champ Sergey Liakhovich (23-3, 14 KOs) on Saturday night at the Nuremburg Arena in Nuremburg, Germany. 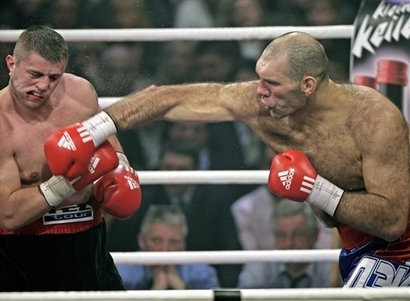 As promised by trainer Alexander Zimin, Valuev looked much more polished as he dismantled Liakhovich. After a close first round, Valuev punished Liakhovich in round two, landing a series of hard shots at the bell. Valuev, the largest and heaviest boxing champion of all time, continued to do most of the damage as the bout progressed. The "Russian Giant's" long jab caused all kinds of problems for the smaller Liakhovich, who just couldn't get anything going. In the end, the only question was whether or not Valuev would get a stoppage. The game Liakhovich refused to go down, however, as Valuev swept the scorecards 120-108, 120-108 and 120-107. With the win, Valuev earned a rematch and a chance to regain his old belt against WBA champion Ruslan Chagaev. Valuev: I will get better!